Sorry for the few weeks without a post. I'm four days and 6K into NaNoWriMo, so the posts for the next few weeks might be few and far between. Today I'd like to talk about book reviews. You might have noticed I don't post many book reviews, especially for a book blog. That's because I really don't like reviews. I feel like people reading reviews come to them from one of two paths. 1) They haven't read the book and want to know what you thought of it. 2) They've read the book and want to know if you agreed with them about it. If I've never read a book, I want to know pretty much one thing and one thing only. Is it worth my time? You can generally get a feel of how well a book is loved by its advantage rating on Amazon or Goodreads. If I'm on the fence about a book and it's in the 4-5 star range, I'm going to read it, probably. If it's 2-3 stars, I'll move on to the next title. There are some other things I'll want to know. Is it clean? Is it appropriate? But those questions are easy to find the answer to on many Christian websites. Once I've found this information, I'll purposely stop reading reviews. I don't want to know how the story ends. I don't want my attention drawn to it's flaws. I notice enough of them as it is. Once I've decided to read a book, there's nothing more I want to know about it then what's between its covers. And I'd rather figure that out by just reading the book. If I've already read the book, I might read a review to see what other people took away from it. If I didn't like it, I'll want to know if that was just me. I'll want to see what so many other people loved. If I did like it, I'll want to know if others loved it as much. 1) I have to feel very strongly about the book, one way or another. I have to either love it or wonder why it ever got published. I don't feel this way about very many books. Like, maybe five a year. And of those, I maybe only look at the reviews on one or two of them. 2) The review changes the way I feel about a book. This almost never makes me like the book more. I'll feel alright about a book, read a few reviews, and realize I really hated that character that died on make 57, and I forgot how much sordid language there is. I skimped over that poorly written scene and I hadn't realized the dark foreshadowing in chapter 3. 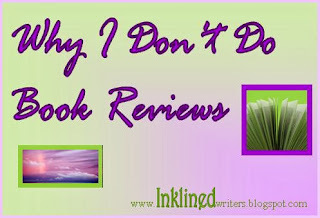 All in all, the bad book review convinces me that I didn't enjoy the book nearly as much as I thought I did. So I have a really hard time getting behind book reviews. I know they help authors, which is about the only reason I sometimes write them. I do my best to avoid reading them whenever possible. I would much rather make up my own opinion on a book. For me, I prefer to just rate the book out of 5 stars and move on. What about you? How do you feel about book reviews? If you read them, what do you get out of them? If you don't read them, is it for other reasons? Let me know in the comments. You've brought up some really great points. I do read book reviews, but I keep in mind that it's just someone's opinion and I try not to let that affect my review of the book. But I agree that can be hard. I wish I liked book reviews. So many people's blogs or majority of their blog posts are centered around them. I like book reviews sometimes, when it makes you excited to read the book yourself, and not just saying, "it was great!" and "I loved it." Many people say that nowadays so I like to find out what made the person "love" a book. Other times reading reviews it's like reading a bad review for a movie you loved or know you will love... a little annoying. Good point. If the review vouches for really great character interaction, (which is my favorite thing in a book) then I will be more excited about reading it. Thanks for stopping by and for the new follow! I like reading book reviews if they're of books I've never read, since it can sometimes point me towards a new series I'd like to try. I agree with you about how book reviews can spoil a book you really loved, but so can talking about the book with people. Reviews just do it faster. Love your blog; following it now. Good luck with NaNo! To each his own. And I have had many a movie spoiled by talking about it afterward. Thanks for the follow! Glad you like my blog. I'm kind of a fan of it too.